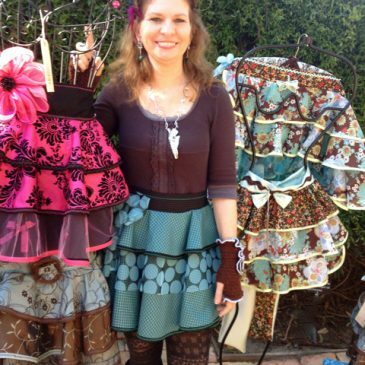 Trish began sewing at a very young age in the sun parlor of her grandmother and her lady friends in Tampa, Florida. Her grandmother operated a local boarding home on the corner of the Famous Bayshore Blvd, that even had a wishing well and a flower garden. The women would discuss local news, politics, religion, books, education, community interests while embroidering, sewing, knitting, tatting, making baskets, painting both acrylic and watercolors, while someone was always playing the piano and break into song. 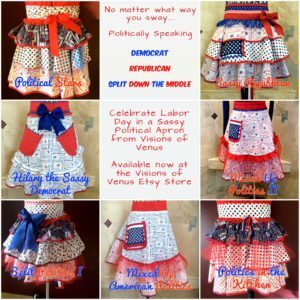 Everyone wore the most beautiful aprons to cover their day dresses, as a southern woman, was always in decor in case guest stopped by. Thus the beginning of her creative clothing. 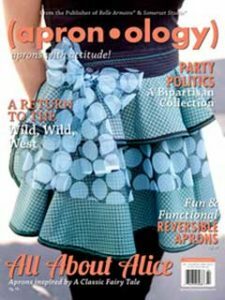 Trish had won numerous and prestigious sewing awards for her creations: American Sewing Guild, San Diego Fair, Cover of Apron.olgy Magazine 2013, Stampington & Company, featured in 4 Apronology magazines, Home Magazine all for her aprons. Her Couture Clothing & Jewelry has been displayed and featured in fashion shows, Published in Altered Couture, Belle Amoire, , Belle Amoire Jewelry and Sew Sommerset. 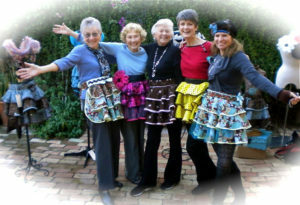 All of Trish’s aprons are one of a kind, individually and hand designed and sewn. ← Teal Gardens – Won Donated Award American Sewing Guild 2016! 1st Place Sewing Award San Diego Fair 2016!